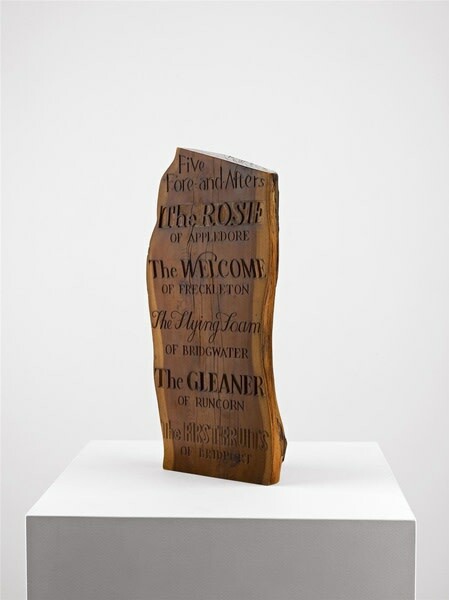 Ian Hamilton Finlay was born in Nassau, Bahamas in 1925 and brought up in Glasgow and the Orkney Islands. In the 1960s he emerged as one of the leaders of the concrete poetry movement and over the next 40 years became one of Scotland's most distinguished artists: a poet, philosopher and gardener with work exhibited in the great museums of the world despite Finlay himself rarely leaving the home in the Pentland Hills where he lived from 1966 until his death in 2006. He is probably best known for Little Sparta, the classical garden he built in the midst of a bleak Scottish moor - a fusion of so many of his artistic ideas and principally of his concern with man's relationship to nature. With the assistance of his collaborators, Finlay translated his proposals into myriad different objects. From sculptures in stone and glass and neon, to postcards, prints and booklets, they are united in diversity by their place in Finlay's fundamentally poetic view of the world. Ingleby Gallery work closely with Finlay's Estate and holds a substantial selection from the archive of his Wild Hawthorn Press in stock. For more information on Finlay's cards and prints please call, email, or visit the gallery.